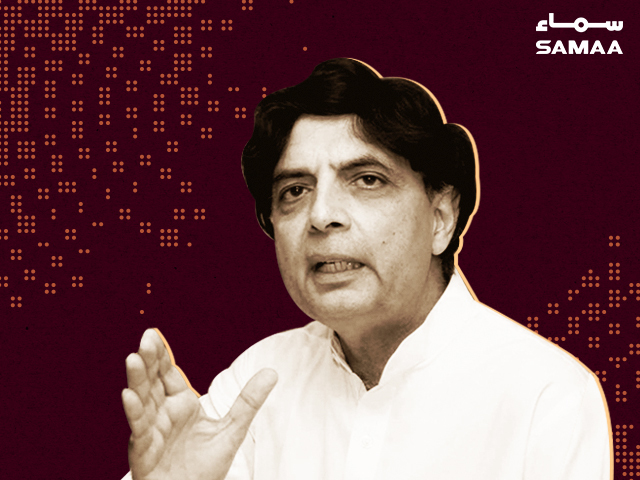 Former interior minister Chaudhry Nisar Ali Khan said on Saturday that if the PML-N had listened to him, it would be in power today. Speaking to the media in Rawalpindi’s PP-10, he said there is no political stability in the country. Without political stability, a country cannot progress, he said. The government needs to understand that without the opposition, the political system cannot function, he added. He criticised the accountability process and said no one has any issues with accountability but the government must take the opposition into confidence regarding the process. Khan said the government should address the opposition’s issues with the accountability process as well. Accountability can be unbiased when it keeps its credibility, he explained. The type of accountability being done with the opposition should be done with the government too, he said. Related: Is PTI gearing up to form government in Sindh? I am telling the people of this constituency that your votes are here but they haven’t been counted, he said. The Supreme Court put an end to the option of a recount and I don’t want to know the details of this, he said. The former interior minister said he won the provincial seat by a margin of 36,000 votes. The PTI had no standing in this constituency, he argued. Despite opening the border, our government isn’t initiating talks with the Modi government, he added. “His [Modi’s] government’s agenda doesn’t contain talks,” he said, adding that they want to be the enemy of Pakistan and Muslims. He also cautioned that the government shouldn’t get stuck in China’s debt. Reiterating that the PML-N would be in government if they had listened to him, he said he is not in the PML-N. By taking oath, it means they accepted the election results, he criticised. I don’t agree. Its not the power that you should be interested in ! Who runs Pakistan is the question ? I think their stand is understandable and acceptable. Time and again all previous Governments have been replaced by Military Governments. THE RESULTS HAVE BEEN MORE OR LESS THE SAME. Sometimes even the Military Dictators have been removed by force … What is the constitution for, what are all the laws for, what are all the swearing in cermonies for? in short i will do what i like and when i like. I DON’T THINK I SHOULD CONTINUE FURTHER. AKALMAND KO ISHARAA HI KAFI HOTA HAI !!! but at this age i am a very disappointed man and regret to see my country going down like this once again.